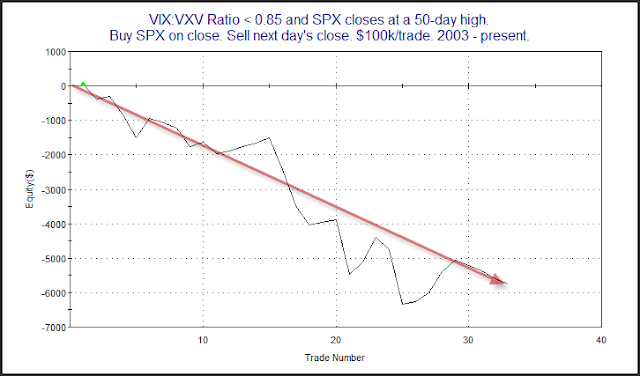 Examining the VIX:VXV ratio is a concept I first heard from Bill Luby at VIX & More. The VIX is a measure of short-term (30-day) volatility expectation and the VXV measures intermediate-term (93 day) volatility expectations. The ratio right now is quite low - a little below 0.85. This means that short-term volatility expectations are substantially below intermediate-term volatility expectations. When readings this low coincide with 50-day SPX highs it suggests a possible bearish edge for the next day. This was demonstrated in a study that the Quantifinder identified yesterday afternoon. It last appeared in the 1/13/11 subscriber letter. I updated it last night. Below is an equity curve showing a 1-day holding period for this setup. 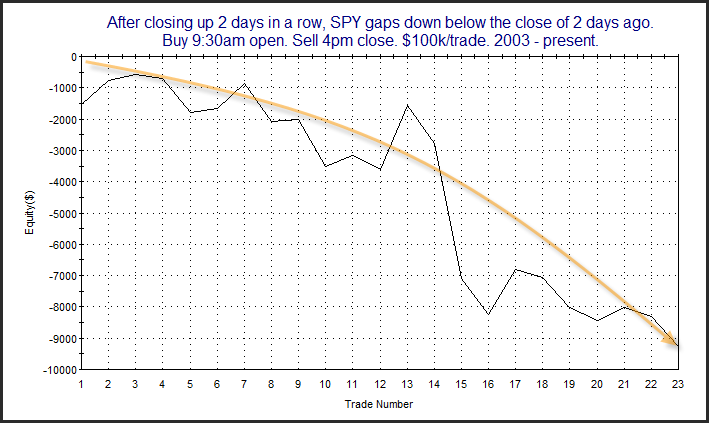 SPY is currently (9am pre-open) trading below the close of the last 2 days - both of which were up days. 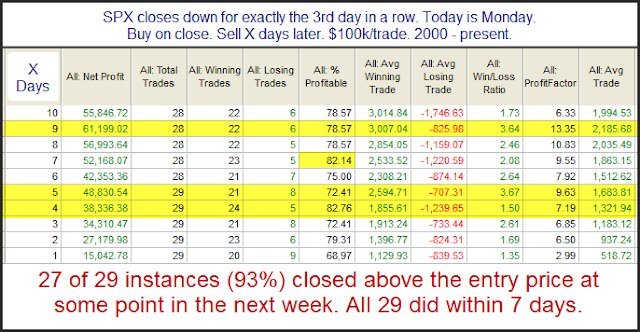 Below is a study that shows how the market has performed open to close when this has occured in the past. Not encouraging stats if you're a bull. Below is an equity curve to see how it has played out over time. The consistent downslope acts as confirmation of the bearish edge. One other note: I also checked to see how many instances occured when the close of 2 days ago was a 10-day low (like now). There was only 1. It was 1/20/09. It was the "worst" performer, losing about 4.3% from open to close. Even if we sell off, I'd be very surprised to see that duplicated. A few weeks ago I held a webinar for subscribers where I discussed VIX-based ETFs. I examined the performance of several of the ETFs. I also presented ideas on how they could be traded as an alternative to a standard index trade, and under what conditions doing so might be appropriate. Below is a chart from the presentation. 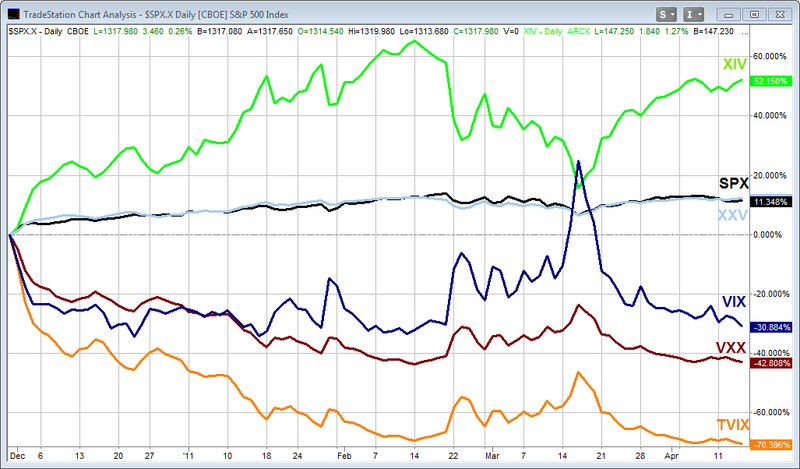 It shows the performance returns of the SPX, VIX, and a few of the more popular VIX-based ETFs. I have updated the chart through 4/14/11. It goes back to 11/30/10, which was the first day that XIV was available to trade. 1) XXV is a product that is "supposed" to act as an inverse of VXX. It seems to do a horrible job of that. Instead it has almost exactly matched SPX performance. I can't imagine ever wanting to trade something that matches SPX performance, but carries greater risk. XXV is useless. 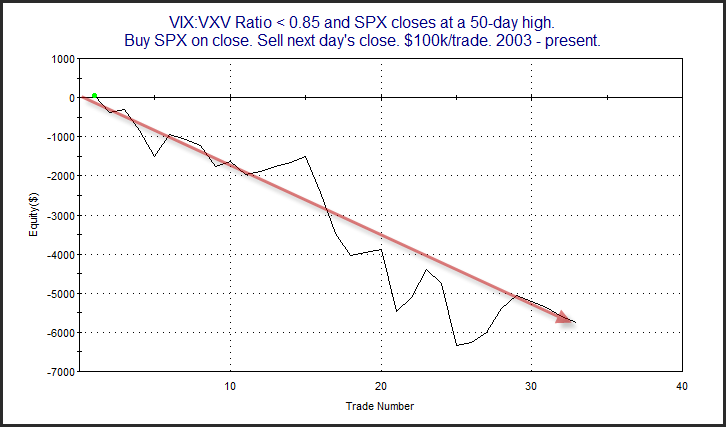 2) VXX has been a poor long-term performer. (I discuss reasons in the video.) TVIX will likely suffer long-term as well. If you are buying for a short-term trade, then TVIX looks like a decent high-powered alternative to VXX. 3) XIV appears to be a nice alternative to a short VXX or a long XXV position. Also, for a more complete list of VIX-based ETFs and some great information, I’d recommend visiting Bill Luby’s VIX and More blog. With the SPX now falling 3 days in a row I'm begining to see signs that a bounce is becoming likely. One bit of evidence identified by the Quantifinder last night was based on the "Turnaround Tuesday" concept. I’ve shown before that of all days Tuesday has historically had the highest propensity to halt a short-term pullback. The study below is specific to a 3-day pullback leading up to a Tuesday. It was last seen in the blog on August 24, 2010. I've updated the results. Results still appear to strongly favor the bulls. The market is looking at a gap down this morning so it will be interesting to see if it can overcome the negaive momentum and make the turnaround today or in the next few days. Readers may recall that April op-ex week has been one of the strongest op-ex weeks over the years. Below is a breakdown from 1984 - present. The consistency has been very impressive - especially on Monday and Tuesday. SPY volume came in at the lowest level in a long while on Monday. I've shown numerous volume studies in the past suggesting price highs and volume lows are typically followed by a pullback. Below is a study from last night's letter that examines the current setup. The numbers here are fairly compelling, especially considering the studies used a long-term trend filter. Bulls may not want to get overly aggressive in the next few days. Risk appears elevated. 1st Day of month bullish tendencies have been well documented here and elsewhere. April is an interesting month in that not only is the 1st day typically strong, but since 1994 the first week has performed especially well. This is illustrated in the table below. Quite the little hot streak. And in case you’re wondering, the last time the 1st 4 days of April netted out to a loss was 2002. Gold Level - Includes nightly Subscriber Letter, the Quantifinder, Charts, Systems, and Downloadable CBI History, Webinars, nightly archives and more. Silver Level - Includes weekly Research Letter, Charts pages, and weekly archives. In this blog I will be examining market action and quantifying my findings. Using sentiment, breadth, price and volume indicators - both standard and customized - I will try and uncover short-term edges which could be taken advantage of by market participants. I will frequently add opinion to these studies and may sometimes post opinions without quantifiable research behind them. All content on this site is provided for informational purposes only. It is NOT a recommendation or advice to buy or sell any securities. I may hold positions for myself or clients in the securities or industries mentioned here. There is a very high degree of risk involved in trading securities. Your use of any information on this site is entirely at your own risk. I have traded professionally since 2001. From January 2003 through February 2007 my bi-weekly column "Rob Hanna's Putting It All Together" appeared on TradingMarkets.com. I have been conducting quantitative research and designing trading systems - mostly focused on short-term edges since 2004.